Last episode, Barry and Cisco went to Earth-2 with Harry to rescue Jessie. However, the transporter on Earth-1 was damaged, which would leave them stranded on Earth-2. In addition, Zoom caught up to them and kidnapped Barry, taking him to his lair where Jessie is. Now, it's up to Cisco and Harry to find him and return to Earth-1. This is The Flash. Zoom is hunting Harry. He leaves several messages across Central City (literally scrawled across the buildings) to bring him Wells. Cisco returns to STAR Labs to recap Harry on everything that happened with the metas and Zoom. Cisco managed to grab Reverb's goggles, hoping they could figure out a way to use them to locate Barry. Harry says they don't have time for any of this because Zoom is hunting them. 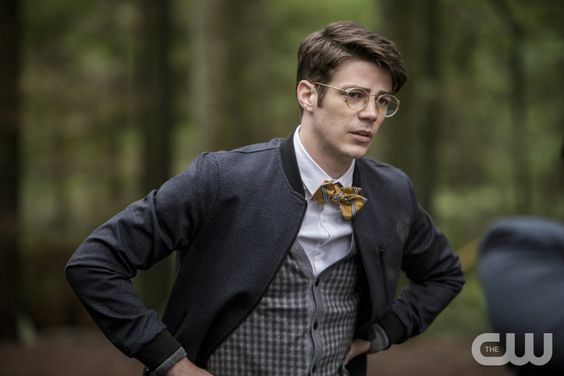 But they've got another problem to deal with: Bartholomew (Earth-2 Barry). He's currently handcuffed in a closet. And he's not happy. They let him out. Then, Zoom shows up. They hide in a secret room Harry built, but Zoom can move through walls. (Great. This is just great.) They trick him with a fake wall, but Harry knows it won't work twice. They go to the CCPD to get help from Iris. Bartholomew explains everything to her. (He's an adorable nerd, and I love him.) In order to find Zoom's lair (Cisco: "He's a bad guy, I'm calling it a lair. "), they need someone who has worked with Zoom. Someone like... Killer Frost? Bartholomew thinks he can find her using an algorithm he created to track reoccurring metas. (I think Cisco should, um, borrow this to use on Earth-1.) They find her location, and Bartholomew--despite Iris, Cisco, and Harry's discretion--decides he's going with them. Meanwhile, Barry tries to comfort Jessie, telling her Harry didn't give up on her and that he's coming to save her. Zoom shows up like the creepy monster he is and tries to scare her. Once Zoom leaves, Barry notices the other prisoner: a man in an iron mask. He continually taps on his cell walls as if trying to tell them something. Jessie is skeptical, but Barry convinces her to help him figure it out. After a time, Barry thinks it's a 5 by 5 tap code used by prisoners of war. They start decoding. The Masked Man spells out the word "Jay." However, Barry doesn't understand what he's trying to tell them about Jay. Barry tells him Jay is alive on Earth-1, but the Masked Man gets upset. Then, Zoom shows up and threatens him to stop talking to them. (Well, technically he wasn't talking to them.) Barry stands up to Zoom, promising to destroy him. But Zoom "phases" into the cell and begins to beat up Barry. When he finishes, he leaves. Barry is okay though. He gets to his feet, smiling. Zoom just showed him how to get out of the cell. The breach is stabilized, courtesy of Jay. (Well, that didn't seem too difficult.) But the Geomancer got away, and Jay wants to stop him. Caitlin continues to dabble with the speed serum, creating Velocity-8. However, she notices Velocity-7 didn't help Jay's condition, but it continued to damage his cells. Jay is convinced he has to stop the Geomancer until Barry returns. When Geomancer returns to wreck havoc, Caitlin gives Jay Velocity-9. He saves the people from the tremors, but he doesn't capture the meta. However, the speed serum doesn't wear off right away. Caitlin runs some tests and learns Velocity-9 is actually healing Jay's damaged cells. However, Geomancer arrives at STAR Labs. (Okay, but what happened to their alarm system?) He attacks, the girls run, and Caitlin manages to blast him with this fancy taser gun. They capture him. Caitlin shows Jay his cells. Velocity-9 worked! (And Caitlin and Jay are so cute, so, so cute.) However, during Geomancer's attack, the speed cannon was damaged. They need to fix it or Barry and Cisco will be trapped (again). Harry, Cisco, Bartholomew, and Iris find Killer Frost. Cisco calls her "Elsa." She attacks, they outsmart her, and they try to convince her to tell them where Zoom's lair is. When she doesn't budge, Cisco tells her about Caitlin Snow--his Caitlin. She agrees to show them. She takes them to a cliff edge where Zoom's lair is high above. (Cisco calls them the "Cliffs of Insanity.") Killer Frost says she'll build something for them to climb up there. Meanwhile, Barry tries to "phase" through the cell wall. It doesn't work. Jessie suggests he could be vibrating at a different frequency (which would go along with why Cisco can't "vibe"). However, Team Flash 2.0 arrives in Zoom's lair. With the surprising help of Killer Frost, Harry gets Jessie out. But her frost powers won't work on Barry's cell. He tells them to go, to get away before Zoom returns. But it's Bartholomew who steps up to talk to Barry. He tells the speedster about the lengths they went through today to find him, about the impossible things he did. He says if he can do the impossible, Barry can too. So Barry tries again, and... it works. Jay thinks he can fix the speed cannon, but it's risky. He'd have to manually turn on all the transporter devices while creating a vortex so he doesn't get sucked in. Joe volunteers to help. It's a tense scene as Velocity-9 starts to run out and Joe flips on the last device. But it works. The breach is open. And just in time. Team Flash 2.0 gets to STAR Labs where Barry bids Iris and Bartholomew goodbye. (They'll head to Atlantis to hide from Zoom.) Harry decides the only safe place for him and Jessie is on Earth-1. Jessie and Cisco head through the portal, but Zoom shows up and grabs Harry. Harry tells Barry to close the breach and tell Jessie he loves her. But Barry refuses to let Zoom win. He grabs Harry and speeds through the breach. They land in Earth-1, yelling to close the portal. They close it. Sort of. At the last moment, Zoom reaches through, grabs Jay through the heart, and snatches him back through the portal. (No. Nooooo. NOOOOOOOO!) I guess Zoom won after all. What did you think of "Escape from Earth-2"?